This Goshen point is described by Frison and Bradley as a point that, "is different in shape from the rest of the points (that were found on the Mill iron site). It is nearly triangular with slightly convex sides and has the slightest suggestion of a basal indentation. We believe that it is very likely that this point resulted from the all-over reworking of a piece of a broken point." Originally, this point may have been larger and a new base was applied after it was broken so it could be used again. This point is made of purple colored Porcellanite measures 1 13/16 inches (4.7 cm) long. Thirty-one projectile points were found on the Mill Iron site. Eleven were found in the camp area, twelve in the bone bed meat processing area and seven points were found on the surface. These points exhibit a fairly wide range of style and flaking technique. Some of the bases are almost straight, while others vary from slightly to fairly deeply concave. 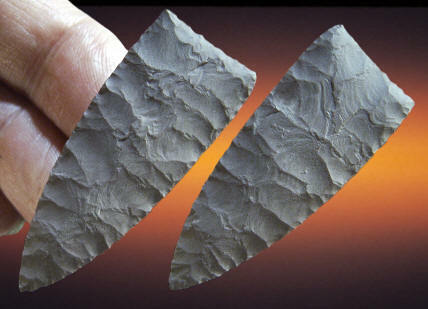 Also, some of the basal edges are concave but are straight at the base of the concavity, similar to some Folsom points. The sides are straight to slightly convex and one example appears to be slightly fish-tailed.